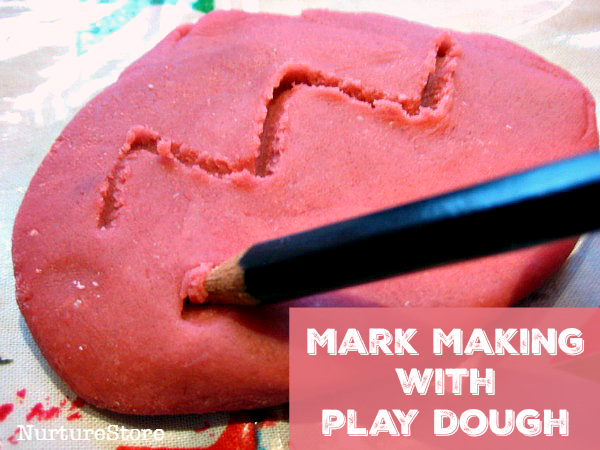 Help your child learn pre-writing skills through mark making with play dough. We are huge fans of play dough in our house. 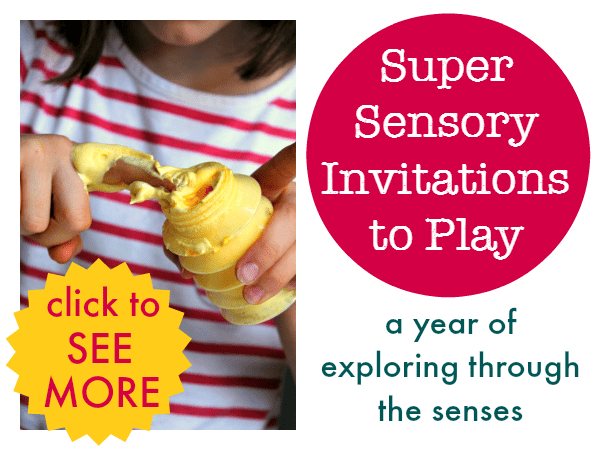 We’ve just made a new batch using our favourite play dough recipe with some orange essence added to bring some smelly sensory fun. 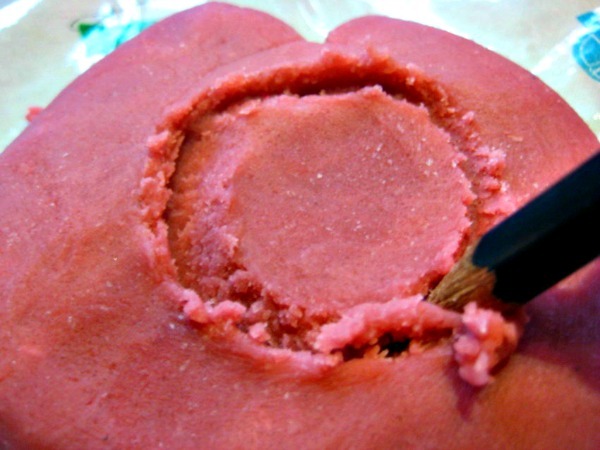 I find play dough is a great activity for after school, especially if we have a mixed age group of children playing. It’s very relaxing as it has the lovely touchy-feely aspect of sensory play and there’s no right or wrong way to play with it – so however old you are (grandparents included!) you can enjoy it, without finding it frustrating or needing any grown-up interference. 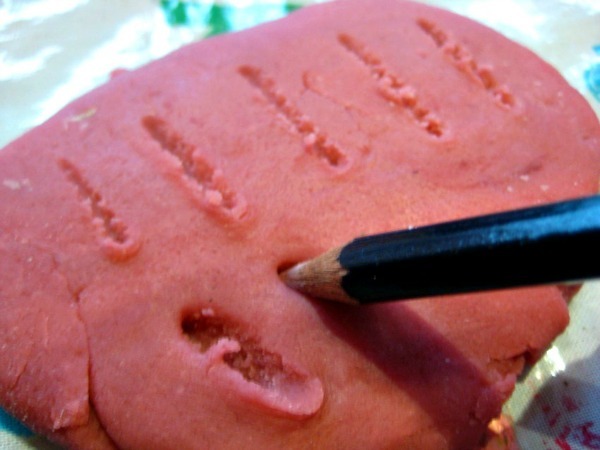 Today I thought I’d mention how fabulous play dough is on the road to learning to write. 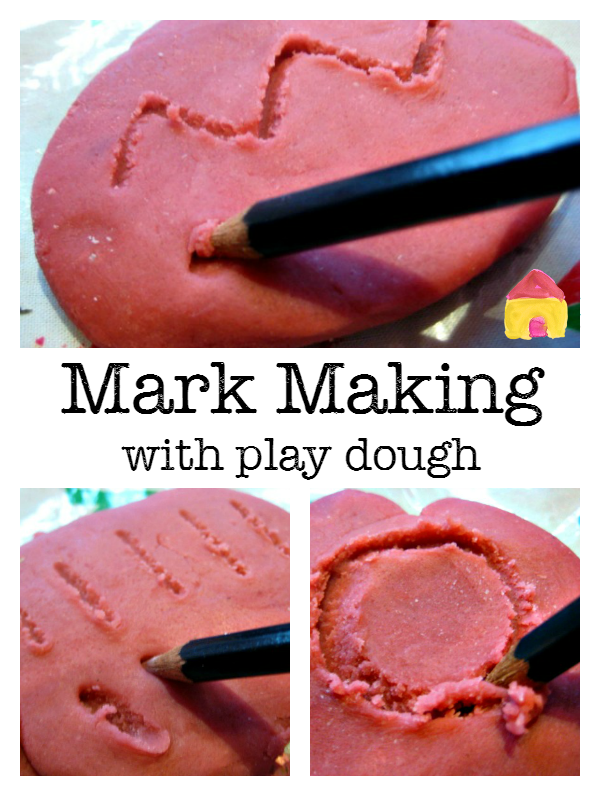 While you might not associate dough with holding a pencil, all the kneading and shaping you do as you play is just right for building up fine motor skills – giving little fingers lots of practise in mobility, grasping and manipulating. If your child is showing an interest it’s easy to extend the play by providing something to ‘write’ with, whether it’s a blunt pencil, stick, feather or other tool. By sitting alongside your child as they play you can model mark making, gently suggesting different patterns to try and seeing if they’d like to copy. Try using a variety of marks which correspond to the shapes included when you eventually begin to write letter characters: horizontal and vertical lines, zigzags, circles, waves and loops. You might find that children who are otherwise reluctant to ‘write’ do enjoy this kind of mark making. It’s a good option to introduce early writing skills to children who show little interest in pencils and paper. I just finished making a new batch of playdough during nap time and then sat down to read a few blogs before the kids woke up and this is what popped up in my reader!! funny! Great ideas. I’m going to try them out with my kiddo this afternoon. Jackie – I think it’s definintely a play dough kind of day today! Love this idea!! Can’t wait to try it with my boys!! My 4 year old is really resistant to writing still. I’ll have to try this and see if it helps increase his interest. Thanks for sharing! Thanks for the reminder – it’s time we made a new batch! I love playdough for its ability to calm frazzled little people! And as you say, I find that it’s one of the few activities that works for both my 2 year old and my 4 year old, at the same time! We like to add glitter to ours sometimes, as well as lavender oil.